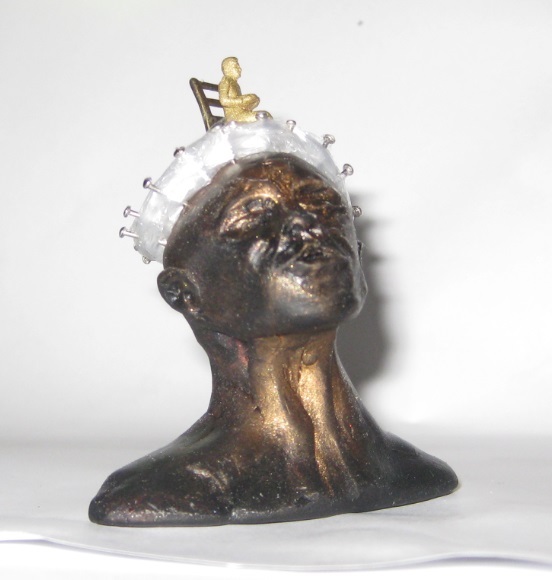 I have a file on my computer called “Heads of Clay.” When you peek inside you see all the progress I’ve made, learning to sculpt exactly that. These tiny clay skulls are less than two inches tall — it might be easier working life-size (or not), but the glass globe always dictates just large a piece can be. Sculpting the heads is one thing, but sometimes (no pun intended) they take on a mind of their own. Like this one: Shrink Wrap. Will I be the only person to think it’s amusing, the visual pun, the play on words? See, there’s a tiny figure of a “shrink” sitting atop a head, which is wrapped. With shrink wrap. Yeah, I wish I could take responsibility for coming up with that through some thoughtful creative process, but it just popped into my head … hey! I’m serious! A person who studies the mind, the shrink, on a head that is wrapped in … goodness! Will I be the only one who thinks this is a hoot? Possibly. Can’t worry about that now, I have more heads to examine. Literally and figuratively. Here’s a glimpse of what else I’ve been working on … off and on … taking the idea of a person and his or her head, and showing what might be inside. Exciting for me, since I’m still fascinated with how and where ideas emerge. Custom snow globes and miniatures sculptures. 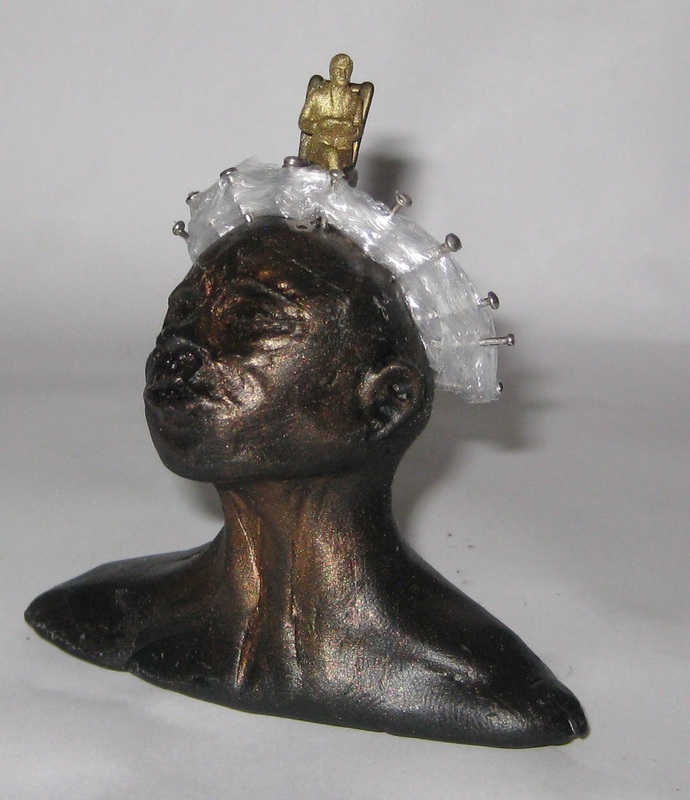 Miniature head sculpture (clay with metal embellishments) in snow globes. All images and designs copyright (c) 2015, Camryn Forrest Designs, Denver, Colorado, USA. I wish I could tell you that I sketched out the lovely profile of Ms Hammerhead and carefully sculpted her exactly as I dreamed her. I was in the early stages of creating a tiny head and bust by hand for a new sparkle globe and decided I had a bit much too much clay, and began to pinch it off. And caught myself as the pinched part began to look distinctly like a hammer. I’ve seen people with similar hairstyles, yet never made the connection before: Hammerhead. Oh, there are hammerhead sharks, and hammerhead people who don’t take “no” for an answer and haven’t time to listen to contradictions from people they consider silly. They tell it like it is, and they stick to their convictions. They are sure and confident and focused. Like Ms Hammerhead here: she advises that you take her seriously. Please do. 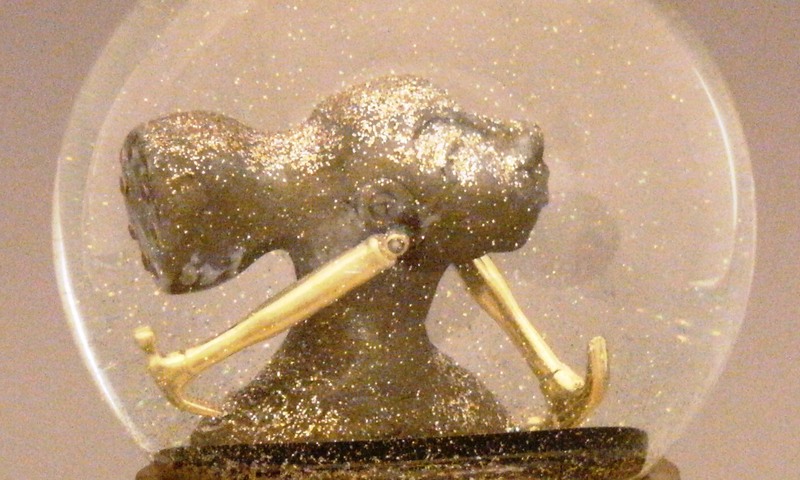 Hammerhead, one of a kind clay sculpture with vintage dollhouse tool hammer earrings inside a one of a kind snow globe, featuring glimmering gold flecks and a single tiny gavel-shaped vinyl hammer in liquid (not shown, but we assure you it’s there when shaken.) The wooden base is painted with a faux metallic finish and topped with tiny finishing nails, driving home Hammerhead’s point. All images and designs are copyright (c) 2015 Camryn Forrest Designs, Denver Colorado, USA.